Finance Active is now ISO 27001 certified and becomes part of the very small circle of 220 ISO-27001-certified companies in France! 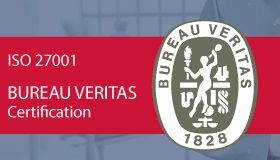 Following the audit conducted by Bureau Veritas, the United Kingdom Accreditation Service (UKAS) granted Finance Active the ISO 27001 certification, which certifies the information security management system (ISMS) and constitutes a step forward towards a rigorous security policy. With the achievement of the ISO / IEC 27001: 2013 certification, Finance Active strengthens the expertise of its teams in terms of financial information usage and management, and further positions the Group as a reliable, secure and proactive partner in financial risk management. Good news for our 2016-2018 “Good vibrations” business plan!